One spring, many years ago, I had a reading epiphany in the check-out line at Rainbow, a huge grocery store on St. Paul's seedy University Avenue. That winter, like most Minnesota winters, was long, cold, and snow white. So long that I feared warmth and color would never come back. But they did, of course. And one sunny day that spring, while I waited my turn with the cashier, I spied Summer People on the book rack nearby. I had been a Marge Piercy fan since my college days. Once, when my oldest daughters were very young, I viewed her up close. Close enough to introduce myself and let her know how much I admired her work. I held back, though. Embarrassed by what I perceived were my own shortcomings as an artist. Instead I observed her and attended to my children's needs. 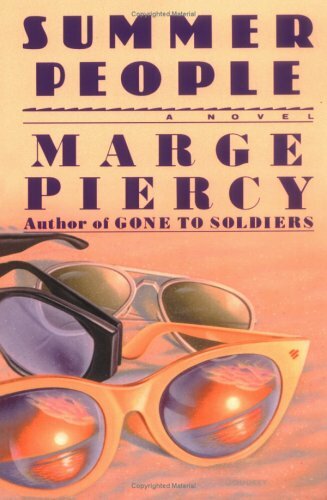 Summer People is a steamy read. It proved to be a perfect summer companion and a welcomed break from my usual fare of more serious and heavy reading. It opened up my reading vista. And not just for summer. There's stack of library books on my studio floor. Two, actually. Individual titles are scattered about the house. A small grouping has taken up residence on my night stand. Added to this delicious mix, are the New Yorkers, enticing issues that had the misfortune of arriving on busy winter weeks. Now it's summer, a season of long days filled with the hope of endless possibilities.